Join me as I attempt to watch 2,500 movies on DVD and Blu-Ray, including films from all around the world and spanning as many genres as I can muster. Check back often...new movies are posted daily! Tag line: "This time it's war"
Trivia: One of the alien eggs used in this film is now exhibited in the Smithsonian Institute in Washington, D.C.
As I said a few days ago, I felt 1979's Alien owed a lot to the dark, brooding atmosphere created by its director, Ridley Scott. Aliens, James Cameron’s follow-up to that film, is a different matter altogether. This time out, its the aliens themselves who'll get your pulse pounding. After surviving her run-in with the creature that invaded the Nostromo, Lt. Ellen Ripley (Sigourney Weaver) launched herself into space aboard an escape pod, set a course for earth, and placed herself in suspended animation for the extended journey home. Unfortunately, her trip would be much longer than she ever anticipated. Somewhere along the line, her pod drifted off course, floating through space for 57 years before being spotted by a passing freighter. While still getting over the shock that she's been asleep for nearly six decades, Ripley is further appalled to learn a human colony has since been established on the planet where she and her crew first encountered the deadly life form. When all communications with this colony are abruptly cut off, a team of specially trained marines is sent in to investigate, with Ripley tagging along as an adviser. Under the command of Lt. Gorman (William Hope) and Sgt. Apone (Al Matthews), the marines believe they're ready to face any eventuality, but Ripley alone realizes that, if the aliens have indeed returned, this mission is doomed before it ever has a chance to begin. Cameron does manage to duplicate the intense mood that made Alien such a hair-raising experience, yet in this entry, the aliens overshadow all other aspects of the film. Not only are these creatures just as strong and intelligent as the one that attacked the Nostromo, but this time, they have the humans outnumbered. As the marines prepare for their assault on the colony’s main facility, Ripley knows (as do we) they have no idea what they’re going up against. Sure, these highly-trained soldiers are armed to the teeth. However, they’re also facing an adversary that cannot be take for granted, something the squad doesn’t realize until it’s much too late. This initial battle is absolutely spine-tingling, the first of many such thrills Aliens will ultimately throw our way. In Alien, we got to know the monster; how it grows to maturity inside an unwilling host, how it bleeds acid, and how damned difficult it is to kill once it's loose. In that film, we watched a single one of these life forms tear an entire ship out from under its crew, and no matter what steps were taken to defeat it, the alien simply would not die. In Aliens, James Cameron shows us what an army of them is capable of, and by doing so transforms his movie into more than a mere sequel; by ratcheting the story up a notch, Aliens also becomes a natural progression of the creature’s mythology, and on this level, as well as every other it aspires to, Aliens does not disappoint. Loved this movie but I can't believe what a sneaky character that Paul Reiser portrays. But the whole cast is excellent & even if you watch it now it's timeless. A all time classic. H E: I know...I couldn't believe how slimy Reiser was in this film, considering what a funny guy he normally is (but he played evil pretty darn well). FOLLOW UP REISER IS SO BECAUSE OF WHAT HE REPRESENTS THE EVIL THAT MAN DO-WITH AN UNEARNED INNOCENCE ABOUT HIM-HE'S THE DEVIL...TA PUT IT BLUNTLY, ADD THE MILITARY MENTALITY, OF FOLLOW THE LEADER AND OOPS,SITUATIONNORMALALLFUCKEDUP!! 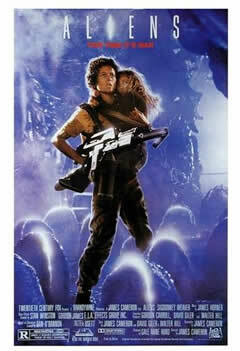 !THEN THERES RIPLEY A SURVIVER/LEADER WHO JUST WANTS TA SAVE THE KID, BOOM FIREWORKS!!!HAHAHA... 'NUFF SAID!!! Loved this movie! In addition to the humans vs aliens adventure, there is the theme of mothering instinct shown by both Ripley and the queen alien creature. 8 Trashy Mexican Trailers to watch over & over & ... over! Mei Actually Met a Ghost — Totoro! Loathed Film : B and Cult Movies | Loathed Film is a blog for true B and cult movie fans around the globe ….Movies with true grit! Drop us a comment and be sure to check us out! © 2010-2016 DVD Infatuation. Awesome Inc. theme. Theme images by i-bob. Powered by Blogger.